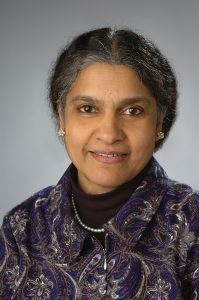 Sudha Raj, Ph.D., RDN, FAND, teaching professor in the Falk College nutrition program, was the winner of the DIFM Excellence in Service Award from the Dietitians in Integrative and Functional Medicine Dietetic Practice Group of the Academy of Nutrition and Dietetics. The award was presented at the Annual Food and Nutrition Conference and Expo in Washington, D.C. on October 21, 2018. Read more in this Q&A with Dr. Raj. Dr. Raj is a Fellow of the Academy of Nutrition and Dietetics and has been actively involved. She has served as Newsletter Editor, Chair for the Vegetarian Nutrition Dietetic Practice Group and Chair for the Vegetarian Nutrition Evidence Analysis Group. 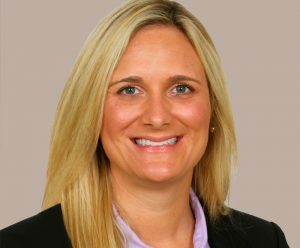 She has also served as a committee member for the development of Standards of Practice for the Dietitians in Integrative and Functional Medicine. Dr. Raj is interested in exploring the role of acculturative factors as they impact the health and well-being of Asian Indian immigrants specifically from India. Since 1994, she has developed dietetics related educational resources, written book chapters and given presentations highlighting the unique Asian Indian culture, food habits and role of food as delineated in the traditional medical system of Ayurveda. Dr. Raj holds a B.Sc. degree in Nutrition and Dietetics from Madras University and M.Sc. degree from Bombay University in India. She subsequently completed her M.S and PhD degrees in Nutrition Science from Syracuse University. The Falk College nutrition program will host “Lebanese Cuisine & Culture and Mediterranean Living,” a lecture presentation and live culinary demonstration with culinary star, TV host, and award-winning cookbook author Julie Taboulie, on Wednesday, March 20, at 4:30 p.m. in the Nutrition Assessment, Consultation and Education (ACE) Center demonstration kitchen, Room 204 in the Falk Complex, as part of the Joan Christy lecture series. In “Lebanese Cuisine & Culture and Mediterranean Living,” Julie Taboulie will focus on her famous food philosophies, “fresh is best” and “health is wealth,” while sharing professional techniques she uses on her Emmy-nominated PBS show, Cooking with Julie Taboulie and Julie Taboulie’s Lebanese Kitchen. Hailed as the “Queen of Lebanese Cuisine,” Julie Taboulie (Julie Ann Sageer), is the host of the Emmy-nominated Cooking with Julie Taboulie and her brand-new award-winning series Julie Taboulie’s Lebanese Kitchen currently airing on PBS stations and Create TV nationwide. Julie is the bestselling and award-winning author of her new cookbook Julie Taboulie’s Lebanese Kitchen: Authentic Recipes for Fresh and Flavorful Mediterranean Home Cooking that is available everywhere books are sold. She is a guest chef on NBC’s Today Show, Hallmark Channel’s Home & Family, and makes special guest appearances on numerous national and international media outlets. As an authority on Lebanese, Middle Eastern and Mediterranean cuisines, Culinary Star Julie Taboulie is a sought-after spokesperson working with world-renowned global food brands, along with national and international culinary and lifestyle leaders. Julie Taboulie believes that “fresh is best” which is not only her brand mantra it is also her food philosophy and way of life. She strives to instill, inspire and influence others every day in extraordinary ways towards living a healthier and happier lifestyle all year long! Julie Taboulie made her mark in the culinary world by making television history in 2012 with producing and premiering her Emmy-nominated and multiple award-winning national Public Television cooking show series Cooking with Julie Taboulie. This breakthrough in American broadcast shattered the country’s “kitchen” glass ceiling to become the first, and only Lebanese cooking series to air in the United States and Canada. Today, Miss Taboulie continues to be the most pivotal pioneer, public figure and personality to motivate the movement of making Lebanese and Mediterranean cuisine mainstream across America, with her brand-new and award-winning Public Television series Julie Taboulie’s Lebanese Kitchen airing on PBS stations and Create TV nationwide. This special series brings to life her love of her Lebanese culinary and cultural heritage in a celebration of all things Lebanese cuisine. Born Julie Ann Sageer in the United States, to an immigrant Catholic Lebanese family, Julie is first-generation and full-blooded Lebanese-American who has been immersed in learning, making and sharing Lebanese cuisine and culture all her life. The Joan Christy lecture series is made possible by The Christy Food and Culture Fund, established in 2005 through the generosity of Syracuse University nutrition alumna Joan Christy ’78, G’81 to provide support for a lecture series in the nutrition program at the University. The event is free and open to the public, with advance registration required by contacting Donna Sparkes at 315.443.5573 or djsparke@syr.edu by March 15, 2019. For accommodations requests, please contact Donna Sparkes at 315.443.5573 or djsparke@syr.edu by March 15, 2019. The Falk College and its nutrition program will host the fourth annual Ann Litt Distinguished Lecture Series on November 15 from 5 to 6:30 p.m. in Falk Complex, Room 200. Nutrition alumna and Cleveland Browns performance dietitian, Katy Meassick, R.D., will provide an overview of sport nutrition practices and discuss the specifics around performance nutrition approaches for football in her lecture, “Sports Nutrition and Application in Professional Football.” The event is free and open to the public. For information about the Ann Litt Lecture and for accommodations requests, please contact Donna Sparkes at djsparke@syr.edu or 315.443.5573 by November 8. 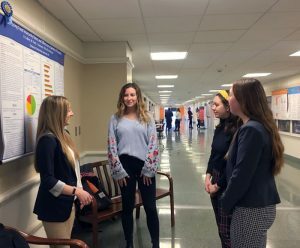 Falk College nutrition major Mary Mik ’19 was named a 2018-19 Remembrance Scholar, along with 34 other Syracuse University seniors honored for their notable scholarship, citizenship, and service. This year marks the 30th anniversary of the bombing of Pan Am 103 over Lockerbie, Scotland, on December 21, 1988. 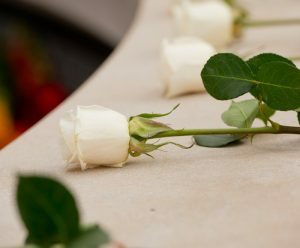 The University’s Remembrance and Lockerbie Scholars have planned events for the week of October 28 during the annual Remembrance Week to honor the 270 people, including 35 students studying abroad through Syracuse University, who lost their lives in the tragedy and to educate the community about terrorism. For a complete list of activities, please visit Syracuse University News. Those who require accommodations to fully participate in these events should contact Kelly Rodoski at 315.443.5381 or kahoman@syr.edu. 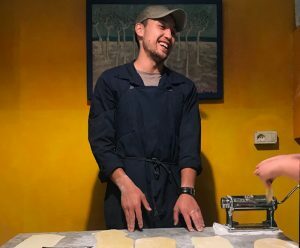 Justin working in one of the kitchens he visited in Italy as part of the Mediterranean Food and Culture course. Any race longer than 26.2 miles is considered an “ultra-marathon.” Syracuse senior Justin Pascual is training for one. For some, it might sound crazy. But for Justin, whose favorite course is organic chemistry, there’s something truly fun about a challenge. As native of Sierra Vista, Arizona, Syracuse wasn’t exactly a familiar place on the map when Justin arrived on campus in 2017. In fact, Justin enrolled at Syracuse University before ever visiting in New York State. 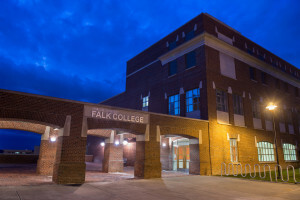 Back on campus, you can find Justin giving tours of campus and answering questions for visiting prospective students as a Falk College Ambassador. He’s also a Ronald E. McNair Scholar. The McNair Scholars Program serves undergraduate students from underrepresented populations to support active student research and preparation for graduate or doctoral study. “I think that’s what it means to ‘Be Orange’: to pave the way for those coming behind us, to create opportunity and invoke inspiration, and to leave a place better than we found it,” he says. 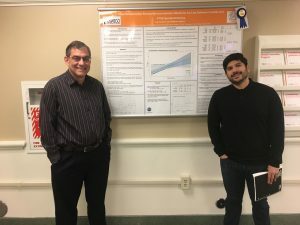 Justin plans to continue his academic career through a Ph.D. in nutritional biochemistry researching nutrition immunology, and to someday work for NASA’s Johnson Space Center in the nutrition biochemistry lab. 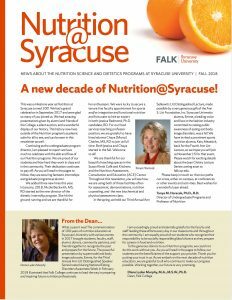 From the latest news and events in the Nutrition program to highlights of student and faculty projects, read the latest edition of Nutrition News covering the nutrition, nutrition science and dietetics programs in Syracuse University’s Falk College. Click on the link below to download a PDF copy of the most recent newsletter or view an accessible, text-based version of the Newsletter.